The extent to which modern technologies affect our daily life keeps growing by the day. The world is turning faster, distances are growing shorter, and information is more and more at hand. The same applies for business and industry. Talk about smart, highly automated and intelligent companies is on the rise. A few years ago emerged Industry 4.0, a concept that defines the changes going on within companies. Whether it is evolution or revolution is irrelevant. The fact is that it is imperative for companies to keep increasing their IQ in order to survive and move forward. For the last few years HT Solution has been working on increasing the company IQ. The software we develop as well as the implementation methodology we use is aimed at increasing productivity, tuning processes, expanding automation, and making use of advanced IT technologies and the Internet. All with one aim: give our customers the ability to react in an ever faster business environment. Our reward is your satisfaction and the resulting good reference for eso/es. The first step when implementing eso/es is identifying bottlenecks in business processes and proposing their optimisation. The fact that the system is implemented by experienced consultants allows us to deliver software with a great deal of added value. Your information system is a living organism we keep improving together with you, not only in the form of software updates but also by new projects. For example, we can optimise your warehouse work by introducing eso/WMS and by improving your production planning process. We continuously develop tools that accelerate and simplify work. Take FormEditor - a tool that allows users to adjust all forms to their own needs increasing their productivity when working with the system. 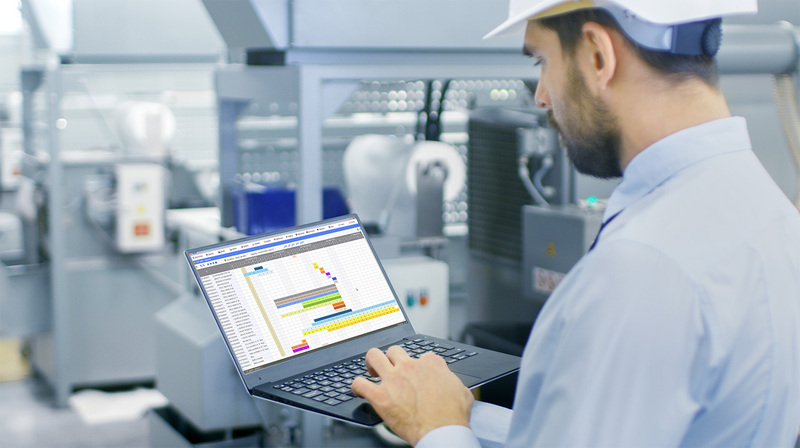 The module eso/IE (Integration Portal) improves communication with production technologies, allowing you to collect, evaluate and process data. eso/es has a special mode for working with modern industrial computers. These are touch terminals designed for production or dispatching staff, different weighing systems, wrapping and labelling devices, etc. We enhance the information potential of your data making it easier to read using Gant charts or by means of our “Alarm” system. Your Dashboard shows you all the key information in a single window. We make eso/es technology faster. Our analytical tool, eso/Discovery, can work quickly and easily with large amounts of data as it uses modern in-memory technology. eso/es tools make increased use of the Internet. From tutorial videos that help you to work with the system more effectively, through Electronic Data Interchange (EDI), up to sharing electronic documents automatically (e.g. QR code invoices). Furthermore, eso/es seamlessly communicates with eso/CRM supporting sales representatives in their fieldwork. Thus, they can, for instance, check your business partner solvency on-line, send their tax return to the tax authorities, and a lot more. eso/es is optimised for work in the cloud. More and more customers have their eso/es in data centres. This means you no longer need to worry about IT infrastructure, but can finally focus your attention on what is important: business. The power of the cloud infrastructure can be increased or decreased almost instantly to fit current company and business needs. Every company is specific. Every one of them needs to improve to survive. Every customer is approached individually and following the principles of Industry 4.0.